We specialise in providing internet access anywhere you want it. RBI Voice is designed to run specifically over your RBI connection. You also get free local & national calls to landlines. Thrilled with the package we received which works perfectly. WN were excellent to deal with, most helpful and obliging with questions and I have no hesitation in recommending them. Excellent service and a contractor who knew exactly what he was doing, explained everything and did a tidy job. So impressed with the speed the modem arrived and how easy it was to setup and use. Am most impressed. RBI (Rural Broadband Initiative) is the government’s initiative to provide fast broadband to areas outside the urban copper and fibre networks. It uses long range fixed wireless towers to provide broadband coverage to homes and businesses within range. The wireless signal is received straight from the modem, meaning there’s no need for an antenna to be installed on your roof. We make it simple by avoiding the need of an installer saving you valuable time and money. If you find yourself out of ‘PnP’ (Plug and Play) coverage then you will need to have an aerial installed on the roof of your home. 4G RBI speeds are usually fast enough to stream Netflix smoothly and use multiple devices connected to the internet at once. $99 one-off on a 24 month contract (includes setup, postage, provisioning, etc.). Want an open term option? Buy the RBI Modem for only $329 and you can give us 30 days notice anytime! Not in a 'PnP' (self-install) coverage area? We can ship you an external antenna and a 10m cable for $119. Need a hand installing the antenna? We have a nationwide network of trusted contractors – we can arrange one of them to install the aerial for you for $249 + $1.15 per kilometre for their mileage (standard install). 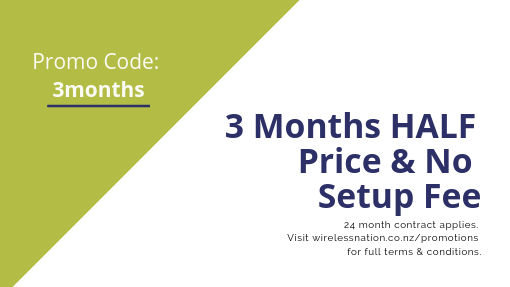 Our add-on data bundles are flexible and are are valid for the month they are bought in, so only purchase as much as you need for the remainder of the month.